Washington Cakes were named for our first President and prepared for his birthday in February, which was a larger celebration in the 19th century. 1) In the cookbook, Cook Not Mad, 1830, the Washington Cake contained currants and raisins. Later cookbooks which had fruited Washington Cakes include Gillette's White House Cook Book, 1887, and The Blue Grass Cook Book, 1904. "Washington Cake. One pound of sugar, one of flour, half pound butter, four eggs, one pound of raisins, one of currants, one gill of brandy, tea cup of cream, spice to your taste." 2) A second type was a lighter cake with salaratus or baking soda, flavored with brandy and nutmeg. Leslie has a delicious recipe for what Elizabeth Ellicott Lea, of Maryland, called a pound cake. "WASHINGTON CAKE. --Stir together a pound of butter and a pound of sugar; and sift into another pan a pound of flour. Beat six eggs very light, and stir them into the butter and sugar, alternately with the flour and a pint of rich milk or cream; if the milk is sour it will be no disadvantage. Add a glass of wine, a glass of brandy, a powdered nutmeg, and a table-spoonful of powdered cinnamon. Lastly, stir in a small tea-spoonful of pearl-ash, or salaratus, that has been melted in a little vinegar; take care not to put in too much pearl-ash, lest it give the cake an unpleasant taste. Stir the whole very hard; put it into a buttered tin pan, (or into little tins,) and bake it in a brisk oven. Wrapped in a thick cloth, this cake will keep soft for a week." 3) Positioned between recipes for pancakes and flannel cakes, the yeast cake in Edgeworth's The Southern Gardener and Receipt Book, 1860 asserts that "This cake derives its name from the fact that it was a great favorite at the table of General Washington; the last two years of his life, it always formed one of the delicacies of his breakfast-table, and is considered one of the standing dishes of a Virginian." "Take two pounds of flour, one quart of milk, with an ounce of butter, heated together; put the milk and butter into the flour when it is about lukewarm; add one gill good yeast, three eggs, a teaspoonful of salt; place it in a pan over-night, and bake it in the morning in a quick oven for three-quarters of an hour." Size. "MAMMOTH CAKE. Have you seen the great Washington Cake? If not, call at the Confectionary of Messrs. John Pease & Son, 45 Division street, foot of Christie, and view it. It is a great curiosity, weighing twenty-six hundred pounds! And, in this festive season, would almost tempt a Grahnmite! It will be cut on the 27th inst., and furnished to those who may wish a portion to grace their new-year's table." Name legend. A story from The Market Book, by Thomas De Voe, NY: 1862, recounted how a freed slave of Washington's living in NYC, celebrated his birthday: "..a most remarkable colored woman, who lived on GoldenHill, corner of Cliff and John Streets, named Mary Simpson, usually known as Mary Washington, as she had once been a most faithful slave of General Washington, whom he had set free, while President of the United States, residing in New York. After she had left Washington's family, she had opened a little store in the basement of this house, where she sold milk, butter, and eggs, with cookies, pies, and sweetmeats of her own manufacture; and she also took in washing for several bachelor gentlemen who resided in the neighborhood. She never forgot her old master's birthday, nor did she want her friends or patrons to forget it, as that day was above all the holidays with her; and she kept it most faithfully, by preparing a very large cake, which she called " Washington Cake," (once a favorite of Washington,) a large quantity of punch, then a fashionable drink, and hot coffee. These were nicely arranged upon a large table; then against the wall hung an old portrait of Washington, which graced the head of the table, and a small leather trunk, on which was marked the initials " G. W.," made of brass-head nails; both of which had been given to her by Washington himself. 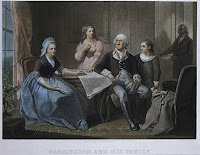 Every anniversary morning, some of the first men, old and young, paid a ceremonious visit to this much respected colored woman, to eat her "Washington Cake," drink her punch and coffee, praise her old master's portrait, and his many noble and heroic deeds; and thus was passed every Washington's birth-day until her death. She said she "was fearful that if she did not keep up the day by her display, Washington would be soon forgotten." I have just recently been to a hearthside cooking event at OSV and have been researching the sources of their recipes ... what a treat to happen upon your blog. So informative and well-researched! Kudos to you, P!